Yesterday afternoon the vet came to the farm. He checked Wise Affair and confirmed that yes, she does indeed have lice. LOTS of lice. We had already figured that out and Linda bought a big container of delousing powder. We were just waiting for the vet to tell us it was okay to treat her. He is quite happy with how bright, alert, and interested she is, and told us just to continue feeding her hay as we’ve been doing. She needs some time for her system to start functioning normally before we start giving her beet pulp, flax, and oil. And even longer before she’ll be ready for grain of any sort. At the moment she is living in a box stall away from the other horses. Because of the young foals that we have now, we dare not let her near anyone without a quarantine period. So every day, while her stall is getting cleaned, Linda walks her around the courtyard. Or, maybe, Weezy walks Linda around the courtyard. She’s quite opinionated and marches Linda around as she inspects everything and noses out the best patches of grass. She likes to come back and check on the stall cleaning progress. What are you doing to my house? She bullies Linda into producing MORE carrots. 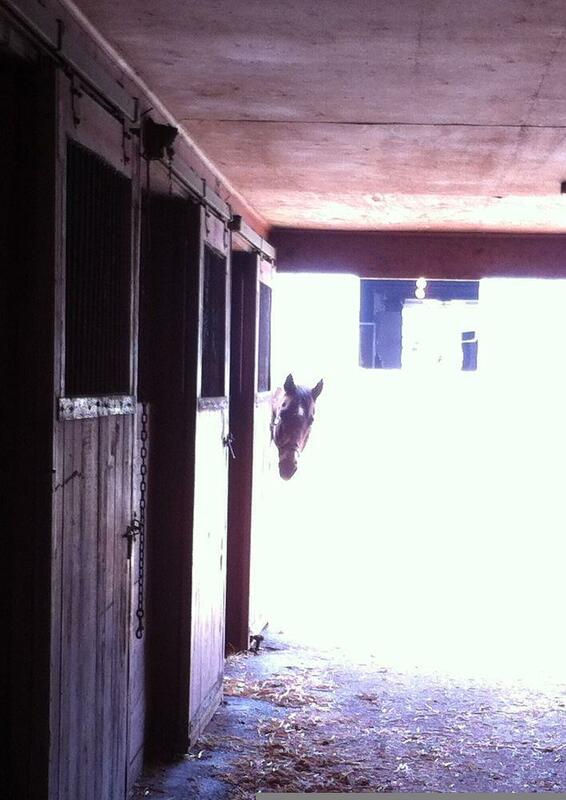 She seems to be quite content to be living in that stall. She doesn’t call to the other horses at all. She definitely does call to the humans though. “Food!! !” she tells us quite clearly “I really like FOOD! Bring more!” She is drinking a lot of water. She washes every mouthful of hay as well, so her bucket is constantly in need of refilling and/or cleaning. In between stuffing her face and drinking, she sleeps. Sprawled out full length on the double depth straw bedding. Today, after her courtyard stroll, we gave her a salt lick to chew on while I poured delousing powder all over her. I used a rubber currycomb to work it down into the long raggedy coat. Within a few minutes the lice started to surface, then dropped off like rain. Lice dying and falling off her neck. Ugh. She was just loaded with lice. It’s no wonder she has rubbed herself raw in so many places! That should help to make her more comfortable. We’ll re-treat in two weeks. She’s looking very slightly better now than she did a few days ago I think. She’s certainly getting perkier by the day. I came directly home and straight into my bathtub. Yuck. I love the stories about Wise Affair. I have Home by Dark with me. Like Wise Affair, she is hungry ALL the time, and drinks pails and pails of water. The tip about lice touched us off… we don’t see any on Home by Dark, but we picked up the powder just the same. We picked her up Saturday, and as we were loading her onto the trailer, the guy started telling us what she ate: “Essential K, beet pulp, etc… etc.” It took all my strength not to haul off and hit him. Those mares hadn’t seen food like that in months. Those people could not wait to see those mares go. The money we gave to them to release Home by Dark never went toward those three mares… when we picked up Home by Dark, the woman was gloating about the brand new pair of Boggs she was wearing to keep her feet dry, and they were talking about the farrier visit of the day before. 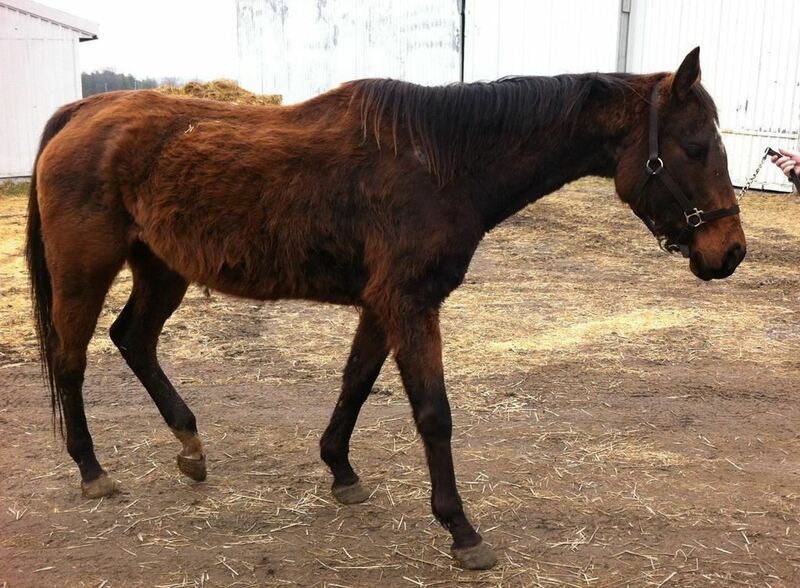 Home by Dark loaded onto the trailer as Ebony, and came off the trailer as Dayo, which means “Joy Arrives”. She lives in a giant stall, and has sacked out after ever meal, flat out and snuggled into a huge pile of shavings. Her stall opens out onto a nice paddock. 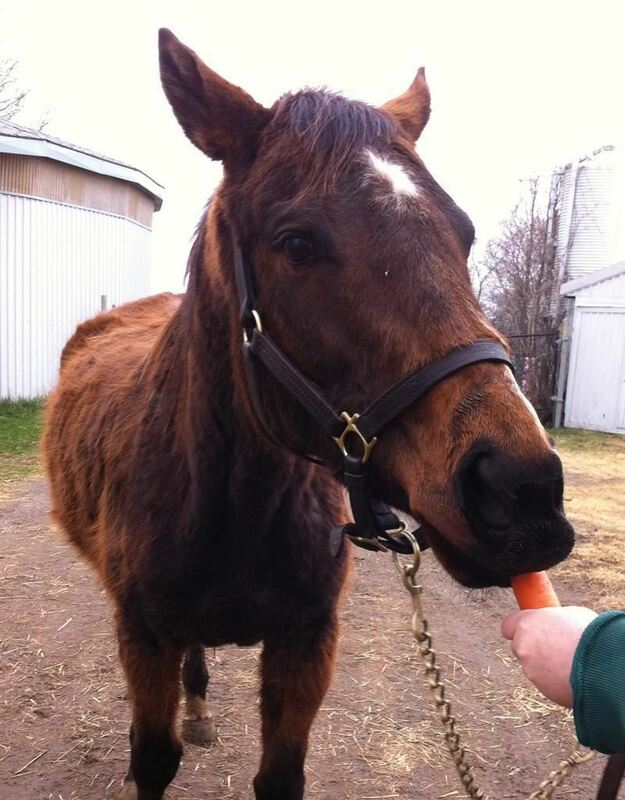 Right now, she is in heat, and has developed a crush on the 32-year old paint gelding in the next paddock. 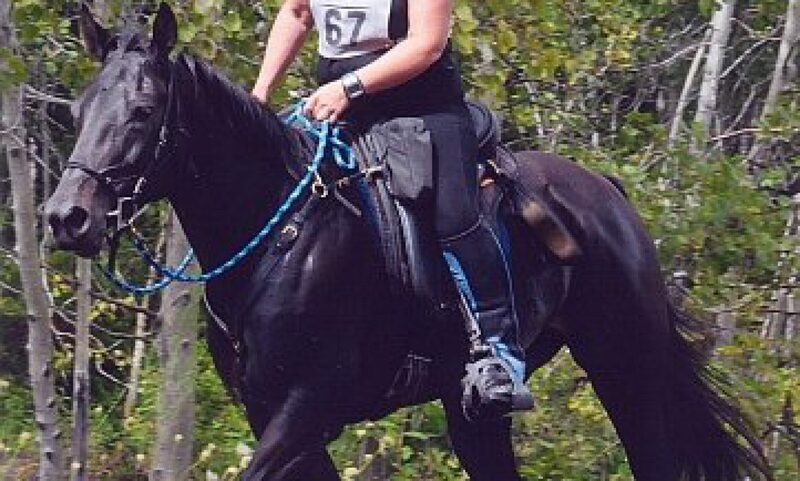 Yeah, that guy was criticizing the nice leather halter that Linda brought when we went to pick her up. Said it was too small (it only needed adjusting). Linda just stared at him, dead-eyed. He’s lucky he lived through the encounter. Please leave a comment now and then about Dayo. I would love to follow her progress too! Nothing I’ve read suggests that it’s really necessary to treat the stall as well. 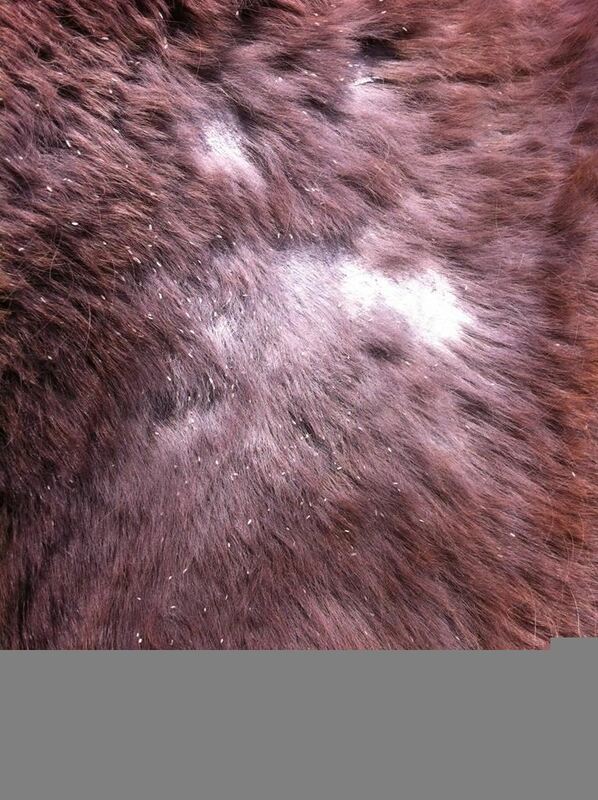 Lice can only live for a couple of days off the horse. 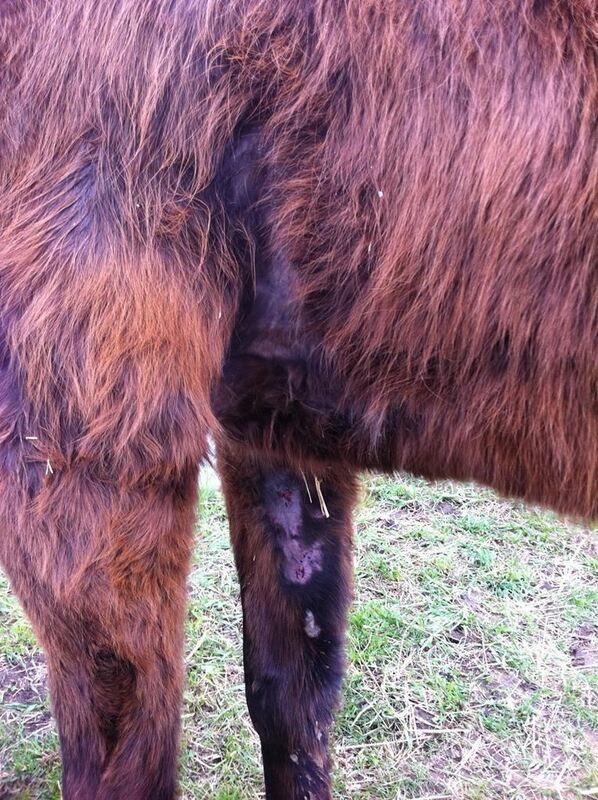 The standard treatment seems to be to treat the horse, then treat again in 14 days. We will likely even treat her a third time, since it’s a pretty severe infestation.